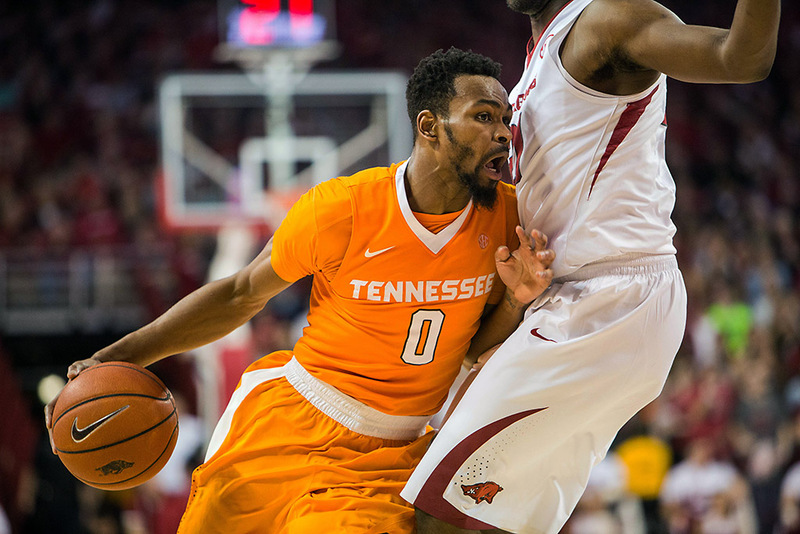 Fayetteville, AR – Kevin Punter caught fire in the second half and finished with 24 points, but Tennessee could not overcome an its first-half struggles in an 85-67 loss to Arkansas on Saturday at Bud Walton Arena. Tennessee (11-12, 4-6 SEC) had a slow start offensively in the first five minutes of the game and the Razorbacks (12-11, 5-5 SEC) seized control early and never relinquished it. After being limited to just four points and 0-of-7 shooting in the first half, Punter scored 20 points in the second half, including a 4-of-6 effort from long distance. He also dished out a career-high seven assists in the loss. The Razorbacks had five players score in double-figures. Moses Kingsley led Arkansas with 17 points and hauled down five rebounds. Dusty Hannahs had 13 points and Anthlon Bell and Anton Beard contributed 12 points each. Arkansas shot 52.6 percent for the game and made nine 3-pointers. Behind Punter’s second-half surge, Tennessee pulled to within 57-45 when he hit a 3-pointer with 10:24 remaining. The Razorbacks’ largest lead of the game was 24 points. Arkansas held a 36-23 lead at halftime. Kingsley led the Razorbacks with 11 first-half points as Arkansas shot 51.7 percent (15-of-29) through the first 20 minutes. The Vols struggled offensively in the first half, shooting just 24.2 percent (8-of-33) from the floor and going 2-of-12 from 3-point range. The Vols missed six-straight shots in the first six minutes of the game as Arkansas built a 12-2 lead. The Razorbacks outscored UT in the paint, 18-6, in the first half. Arkansas’ bench scored 20 points in the opening half while Tennessee’s bench managed just two points. Arkansas limited Tennessee leading scorer Kevin Punter to just four points in the first half (all on free throws) as the senior guard went 0-of-7 from the floor. Punter made his first three shots of the second half and finished with 24 for the game. He has scored 20 or more points 17 times this season, including the Vols’ last three games. Following a rough first half, Tennessee responded with improved shooting after halftime. UT shot 46.9 percent in the second half and went 8-of-15 from 3-point range. Punter (20 points) and Phillips (12 points) combined for 73 percent of the Vols’ second-half scoring. Tennessee was 10-of-27 (37 percent) from long range, marking the 12th time this year that the Vols have made 10 or more 3-pointers. The Vols were 8-of-15 from beyond the arc in the second half. The Vols return to Thompson-Boling Arena to host SEC rival Auburn on Tuesday, February 9th. Tip-off is slated for 7:00pm ET/6:00pm CT on SEC Network. Tennessee is 75-38 all-time against Auburn and 47-7 against the Tigers in Knoxville. On January 2nd, Auburn took an 83-77 win over the Vols at Auburn Arena, snapping UT’s eight-game winning streak in the series.